X Marks the Spot Pattern Launch! 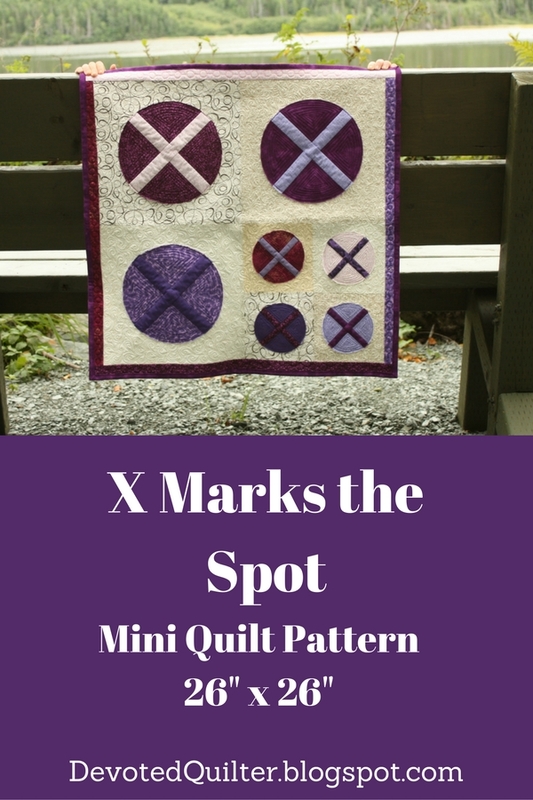 My X Marks the Spot mini quilt pattern is now available for sale! This mini quilt finishes at 26" x 26". 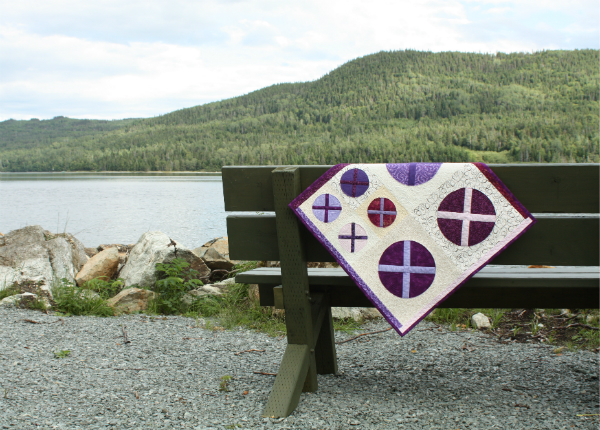 People say that quilty inspiration is everywhere and this quilt really proves that! 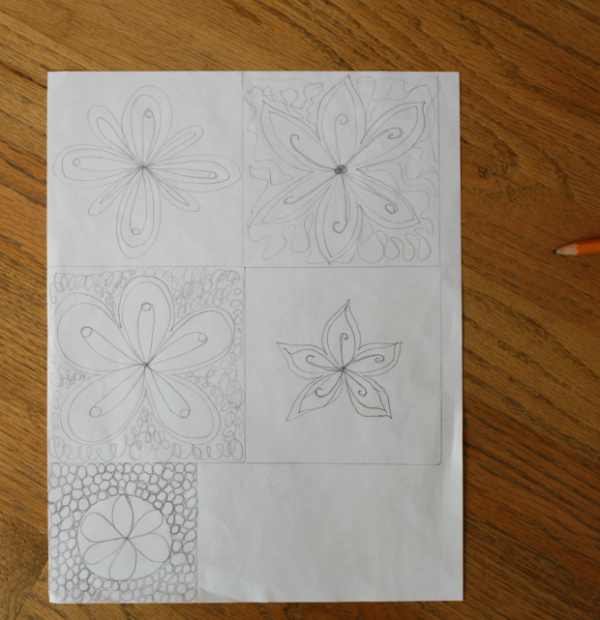 Last spring Alyce, of Blossom Heart Quilts, hosted the DIY Design Challenge on Instagram. If I remember correctly, for the first week her instructions were simply to take pictures of whatever you saw that could serve as inspiration for a quilt. 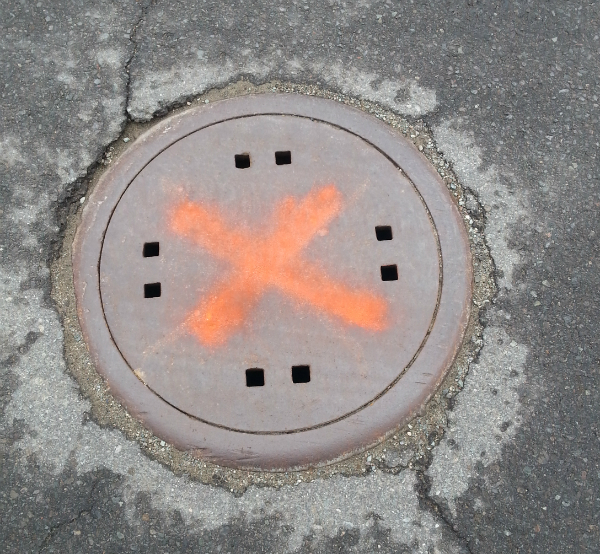 Well, one day that week I went for a walk and discovered that someone had taken orange spray paint to all the manhole covers. I immediately stopped to snap a picture. I'm sure anyone looking out their window thought I was crazy, stopping in the middle of the road to take a picture of a manhole cover! The x's are pieced into the spots and the spots are appliqued onto the background, so the quilt comes together really quickly. 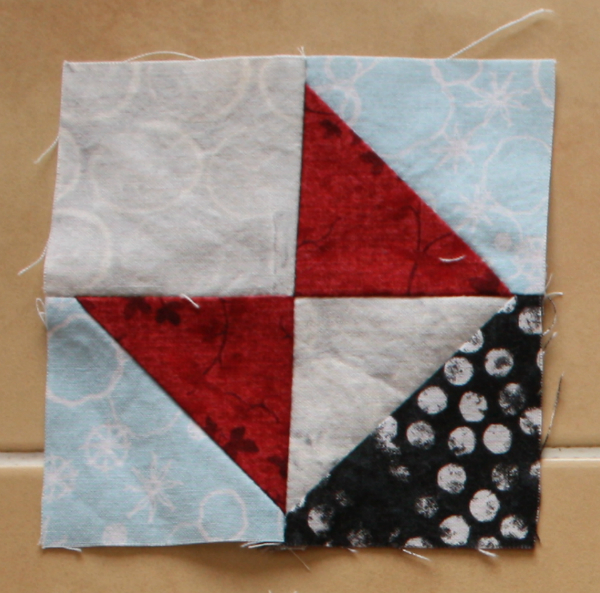 X Marks the Spot is a great way to use up a few of those never-ending scraps. The strips needed for the x's are only 1" wide (for the small spots) and 1 1/2" wide (for the large spots). Download your copy of the pdf pattern through either my Etsy shop or my Payhip shop now! If you make your own X Marks the Spot quilt, I'd love to see it! Tag me @devotedquilter if you post a picture on Instagram, send me a link to a blog post or even just email me a picture (devotedquilter at gmail dot com). Paul started watching the volleyball early on and I joined in partway through the tournament. I couldn't believe the power behind some of the hits! At one point, the announcer explained that players standing at the net lace their fingers behind their heads while their teammate serves because if the serve is low and hits the back of their head, it has so much force it could cause a concussion! And serves were low quite often...not into player's heads, but into the net. Sometimes two or three serves in a row would hit the net. And each one of those serves meant a point given to the opposing team. Ouch. What impressed me was that no matter who was playing, men or women, or which country they were from, no one ever got upset about those serves. Well, maybe the coach threw up his hands, but that was about the extent of it. The players just took it in stride. They nodded at the player who just messed up the serve, those close enough clapped him or her on the shoulder, they touched hands all around to show their team spirit, and they got ready for the next play. Not once did one player get upset at another for giving away a point. Not once was there a show of anger. Not once did one player shun another. Why? Because they all know it's entirely possible their next serve will end up in the net. They've all done it before. They all know they'll do it again. This is where we Christians sometimes get it oh, so wrong. We see someone sin and we jump in to judge them. We question their salvation. We shame them. We forget that we have sinned before and we forget that we will sin again. In 1 Corinthians 10:12, Paul wrote, "So, if you think you are standing firm, be careful that you don’t fall!" In other words, if you think you're doing better than someone else...if you think you're holding steady and secure...then you better watch out because you could be losing your balance already! It is exactly that feeling of security which leads to the falling, because it is when we feel there is no danger of us giving in to sin that we forget to be vigilant. That is when we slip, because we aren't paying attention. That's also when we're most likely to be harsh when someone else sins. At some point or another, we have all been the one to serve into the net and give up a point to the opposing team. We need to remember that at all times. Then, when others sin, we won't be so quick to jump on them in judgement. We will remember that they are just like us. That we are just as likely to get it wrong as they are. Then we can offer them a pat on the shoulder...a word of encouragement...a virtual (or even a real) touch of the hand to indicate our team spirit. Not to excuse their sin, or pretend it doesn't exist or that it doesn't matter. Sin always matters and always needs to be dealt with. 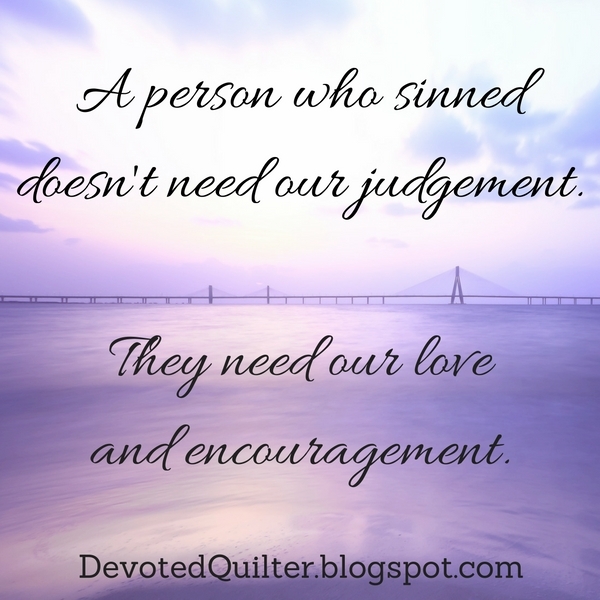 But the person who sinned doesn't need our judgement. They need our love and encouragement to shake it off and focus so they're ready for the next play. Last winter and into the spring, I spent a fair bit of time researching different activity trackers and trying to decide what I wanted. I needed to replace my running watch, which tracks distance, time and pace while I'm running, but I also wanted a daily step counter because I figured it would motivate me to move more. I didn't want to buy two devices, so I was looking for something that would do both well. At one point, I bought a Fitbit Surge, but promptly returned it after seeing how ridiculously huge it looked on my wrist. When I posted a picture of it on Instagram, one person compared it to wearing a 1980s television :) I finally decided on a Garmin Forerunner 235 and I love it! It is really easy to use and to read while I'm running and the daily step counter sets goals for me based on how many steps I've been taking. If I reach my goal on one day, then the goal the next day will be a little higher. If I don't make the goal for a few days in a row then it will drop slightly. Lately I'm sure my watch thinks I'm broken because I've been watching so much Olympics that my daily goal has dropped by about 2000 steps! Now that the Olympics are over, I really need to get moving again! In order for my watch to count my steps, I have to be wearing it. It can't count my steps if I leave it on my dresser, or if it's sitting on the kitchen counter. The more I think about God counting my steps, the more I smile because that means He has to be right with me all the time. If He weren't with me, He'd miss the steps it takes me to walk to the post office, or the steps between my bed and the kitchen when I stumble out in the morning for breakfast. But He doesn't miss those steps because He is with me every moment, all day long. We are told several times in the Bible that God will never leave us (Hebrews 13:5, Deuteronomy 31:6 and 31:8 and Joshua 1:5). And Jesus told His disciples, "And surely I am with you always, to the very end of the age" (Matthew 28:20). Now, I have read or heard those verses many, many times. I have known for years that God is always with me, but I've kind of thought of it in a rather general sense. Kind of like I'm with Paul and Aiden right now because we're all in the house together, but Aiden is playing his guitar in his room and Paul is working on his computer while I'm typing on my laptop. We're all here together, but we're not really paying attention to each other, know what I mean? But God's not just here with us in a general sense. He is paying close attention to us, so much so that He knows what we're doing - all the time. Also, in order for my watch to count my steps, it has to be turned on. Though the Garmin does track sleep, I don't bother to wear it at night, so if I don't turn it back on in the morning it wouldn't matter at all if I had it on my wrist or not. It also wouldn't matter if I was wearing it or not if the battery were dead. Likewise, if God were asleep or dead then He wouldn't see my steps. But He's not alseep or dead! Jesus said in Revelation 1:18, "I am the Living One; I was dead, and now look, I am alive for ever and ever!" And Psalm 121:3,4 says, "He will not let your foot slip—he who watches over you will not slumber; indeed, he who watches over Israel will neither slumber nor sleep." Isn't that reassuring? God doesn't miss a single step we take. and may my crops be uprooted." Job continues on in this vein for quite a bit longer, but I think you get the idea. 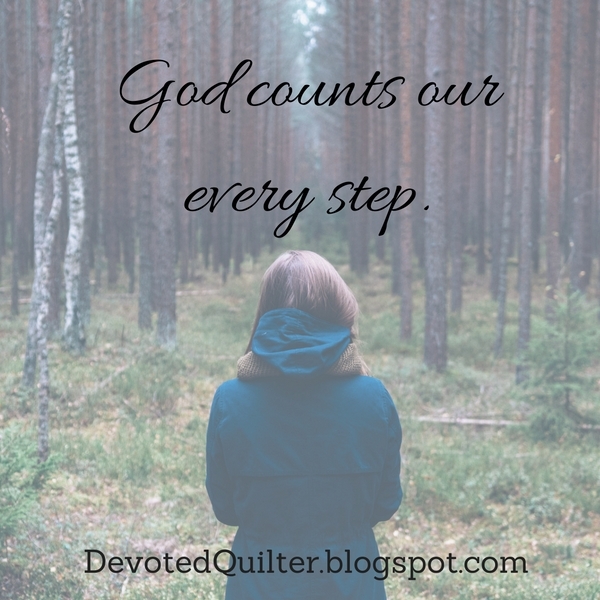 It is not that God counts our steps to keep us moving, or even that He keeps a running tally in His head for each of us. It's more the idea that God cares strongly about how we live...where our steps have taken us, so to speak. As always, it is our heart and attitude that matters most and both are often revealed by the steps we take. Welcome to the Then...and Now linky party! We quilters spend hours with our noses only inches from our quilts. We know every stitch that's out of place, every seam that went a little wonky and every place where the points didn't match up. Because of that, we are often our own worst critics. We are always trying to make our current quilt better than our last one. There's nothing wrong with that...in fact, it's great to keep learning and improving our skills...but sometimes we forget to look back and see how far we've come. We're so focused on what we can't do right yet that we barely even notice the things we've mastered. Let's fix that! 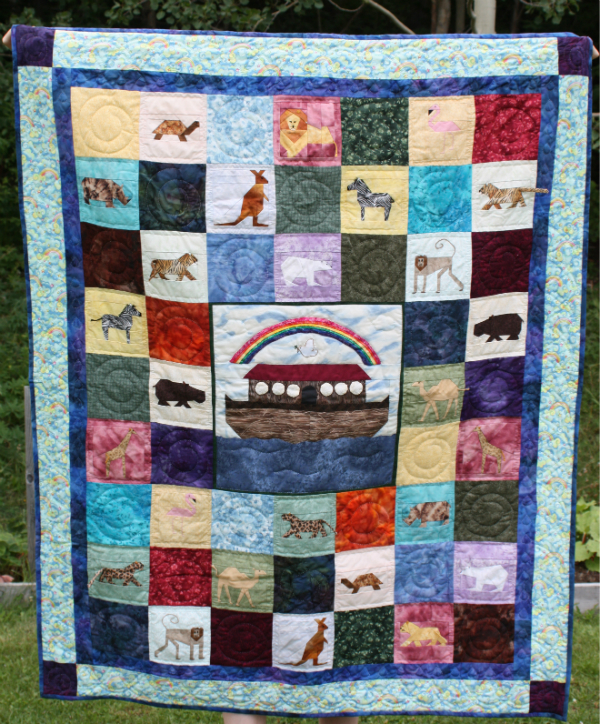 Let's take a look back, really look at some of our earlier quilts and then at our more recent quilts. Let's celebrate all the things we've learned to do, or to do better, whether that's free motion quilting, cutting more accurately, trimming units so points match up better, foundation paper piecing, hand applique...There are many skills we may have learned, so let's celebrate them all! Write up a blog post sharing where your skills used to be and where they are now. Then link up here and we'll all celebrate together :) Don't forget to add a link back here in your post so others can join in too. Here's a handy-dandy button you can use, too. And if your new skills are in knitting, crocheting, garment sewing, or whatever other fiber art you're currently obsessed with, let's celebrate that too! This linky party will stay open until August 31st, so check back later and visit some other link-ups and celebrate their progress. I've been noticing for a while that we quilters (and makers in general) are our own worst critics. We know (and often share) everything that is wrong with our quilts, but we don't often celebrate the things we've learned to do well. 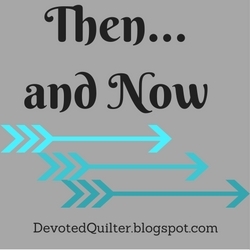 I think it's time we shift our focus, so I'm hosting the Then...and Now linky party for the remainder of August. 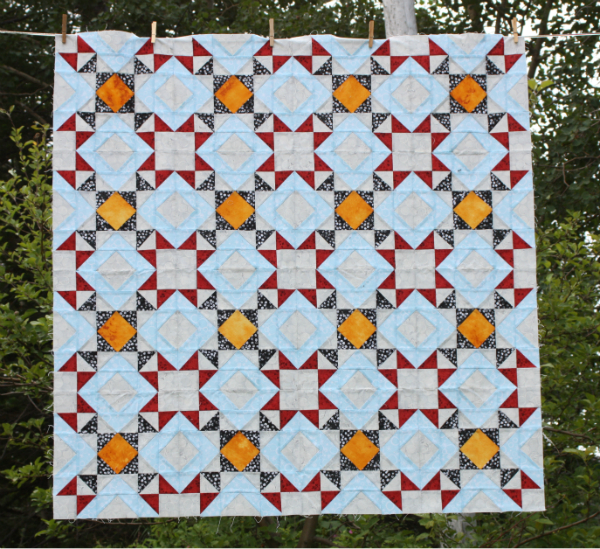 Look back at your earlier quilts and write up a blog post about any (or all!) of the many things you can now do better, then link it up with the party. I don't own any of my earliest quilts, so though I know for certain my first one was pretty bad, I can't really compare them with my current quilts. I certainly can compare my machine quilting though! Then this quilt took me 6 years to finish, mostly because I kept putting it away for months at a time because the hand quilting was taking f.o.r.e.v.e.r. Around this time, I started realizing two things. First, I wouldn't finish very many quilts if I insisted on hand quilting everything. 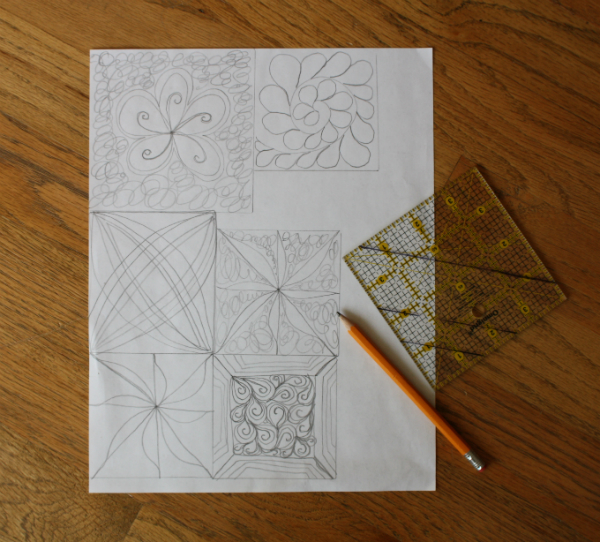 And second, I could never even consider attempting any of the incredibly detailed quilting I loved in magazines if I insisted on hand quilting everything, unless I was willing to do all of my incredibly detailed quilting on quilts no larger than coasters. While I love mini mini quilts, I want to make big quilts at least some of the time! For Christmas one year I decided to make a bunch of small wallhangings as gifts and I machine quilted them all. It was a breakthrough moment! 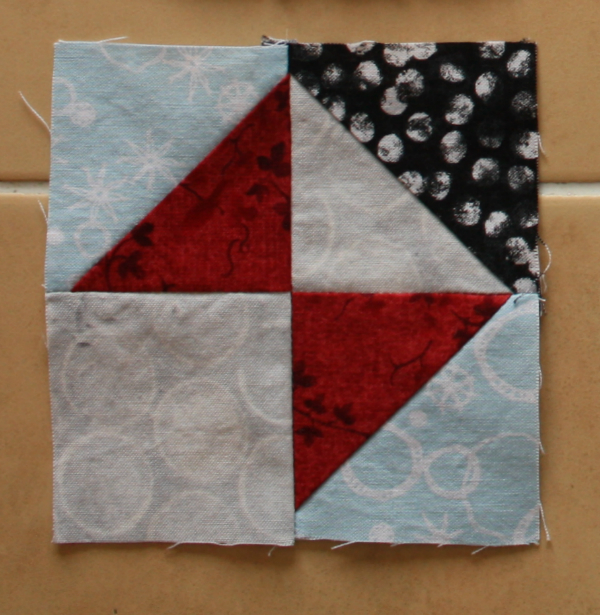 I could make 6 gifts and actually finish them in time for Christmas and I really liked the way the (very minimal) machine quilting looked. That was the year my husband gave me a new sewing machine for Christmas and shortly after Christmas I ordered a walking foot and a darning foot for the new machine and set about trying to learn machine quilting. 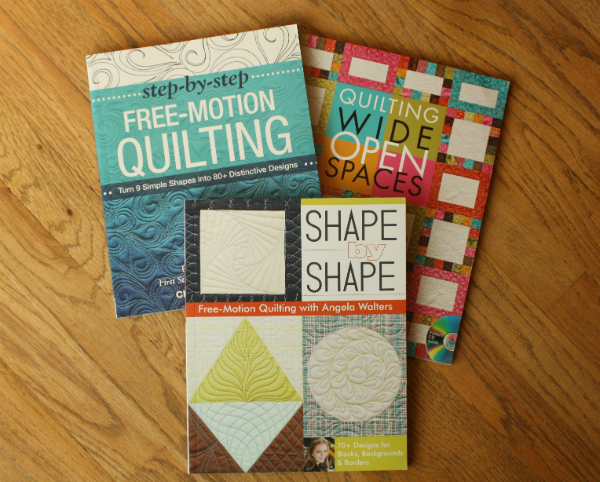 Enter Craftsy, with their many machine quilting classes. 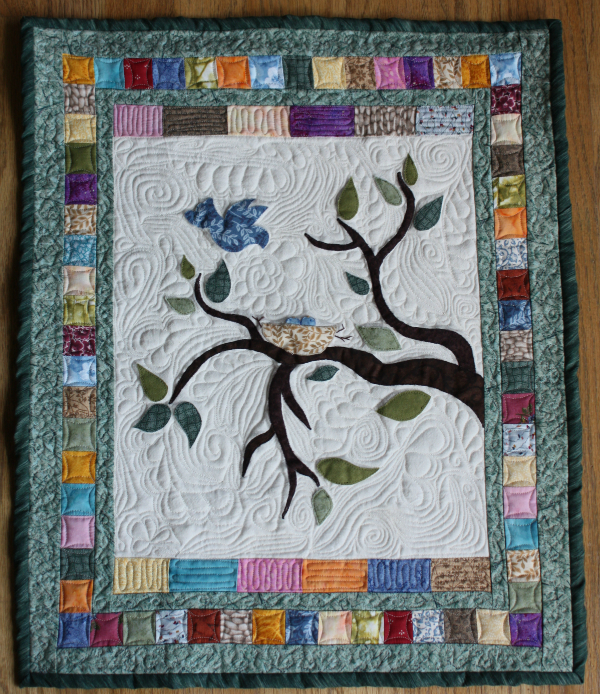 The first one I took was Machine Quilting, with Wendy Butler Burns and I've since taken Craftsy classes with Cindy Needham, Angela Walters and Christina Cameli. Those links are affiliate links. 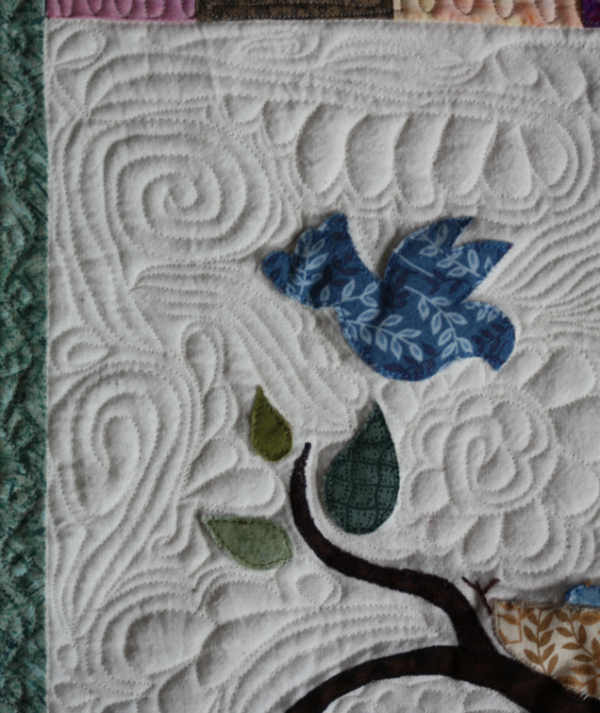 This was one of my earliest attempts at free motion quilting. I had no idea what I was doing...I was just trying to imitate the quilting done on the quilt in the magazine. I confess I can't remember which magazine or who designed it. Sorry! You can see my lines are anything but smooth. Those spirals, and everything else actually, are crazy awkward and cramped! I love this quilt, though. It hangs on the wall in our upstairs hallway and I love looking at every one of those awkward lines :) It's a great reminder of how far I've come. My Scrappy Log Cabin quilt took me over a year to quilt (again because I kept leaving it for other things!) and I saw a lot of improvement in that time. 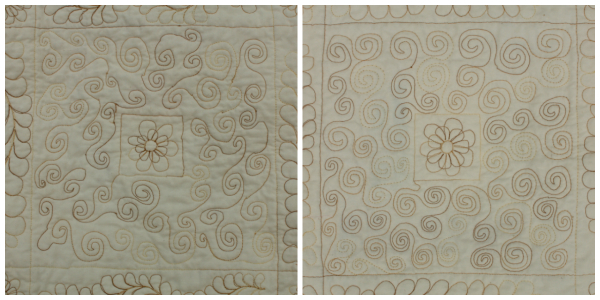 The spirals on the left are one of the first blocks I did and the spirals on the right are one of the last blocks. What a difference, right? 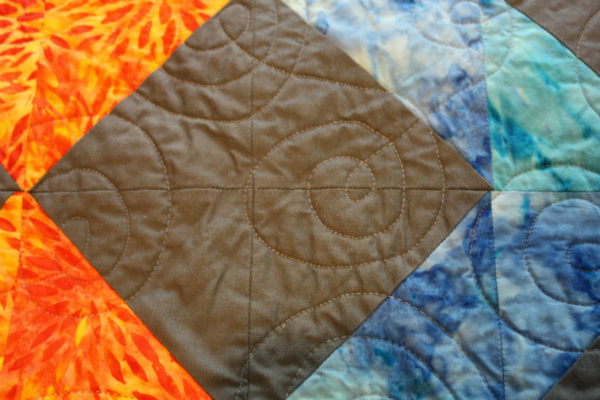 Back when I was working on it, I shared pictures of both my early spirals and later spirals to show my progression, and I remember that someone commented and said something along the lines of, "Your quilting doesn't make me feel woebegone." I loved that! First of all, woebegone is an awesome word that we just don't use often enough and second, I was sharing progress pictures to show that it is possible to get better at this fmq thing. It seems crazy hard when you start and it seems like everyone else is better at it than you are, but it is possible to improve. 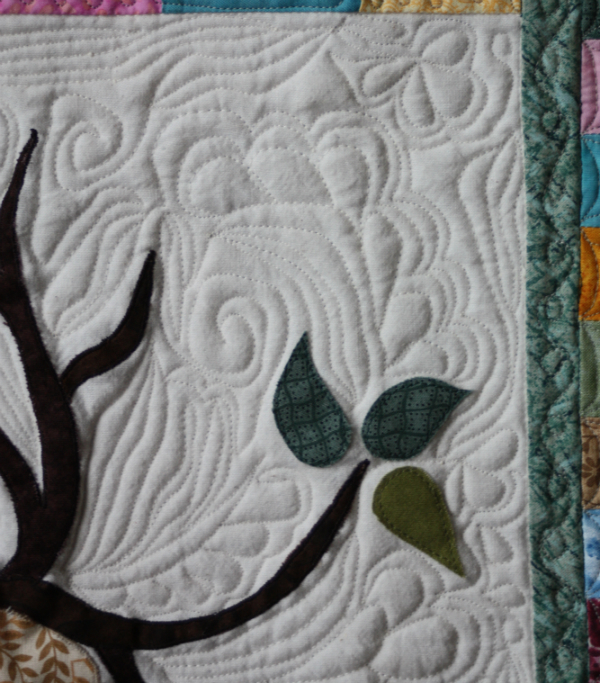 I loved that my quilting gave her hope! 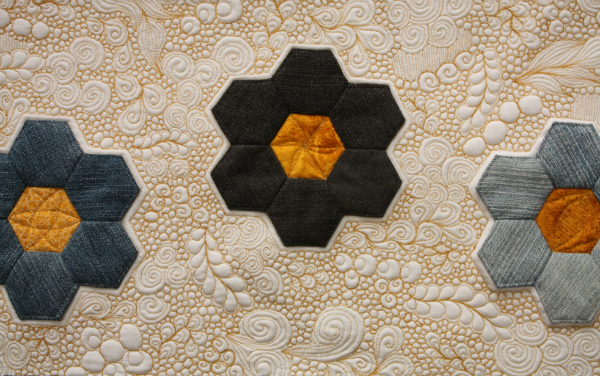 My Denim Hexies mini quilt is my most recent heavily quilted piece and I'm amazed by the difference in my quilting! It's still not perfect. There are elements that aren't shaped as nicely as I would like and places where the travel stitching isn't right on the lines like it should be. Overall, though, I absolutely love it! 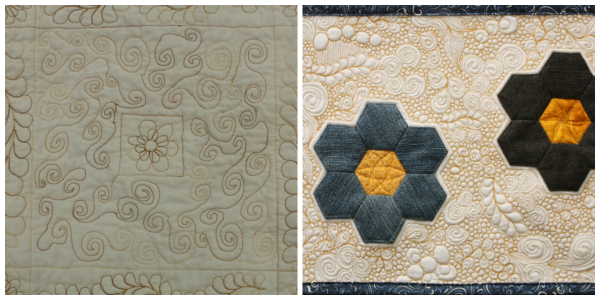 I couldn't resist creating a collage of those early spirals and the denim hexies flow quilting. Seriously, that has me grinning like crazy! I can't believe how much I've improved! So that's my Then...and Now. What's yours? Write up a post about it and link it up so I can celebrate with you! Thank you all for hanging out with me these past couple of months as we've considered the fruit of the Spirit. I have one more thought on the subject today and then we'll move on to something else (I promise!). In case you need a refresher, here are the links to all the previous posts in the series - the introduction, love, joy, peace, patience, kindness, goodness, faithfulness, gentleness and self-control. And, for the last time, our verse for this series is Galatians 5:22, 23, "But the fruit of the Spirit is love, joy, peace, forbearance, kindness, goodness, faithfulness, gentleness and self-control. Against such things there is no law." A few years ago Aiden was fascinated by stupid laws and his favourite by far was from Alberta. The law stated that when a prisoner was released from prison, he had to be given a gun, bullets and a horse!! Presumably this was to help said prisoner get out of town and therefore out of the hair of the local authorities, but doesn't it sound rather self-defeating for the authorities to arm someone they already know is a criminal? Though some laws may be questionable, civilizations generally make laws with the intention to protect their citizens and maintain public order. Laws are written to declare which actions are so unacceptable that they will be punished by the authorities. From the major crimes (murder) to the minor ones (littering) societies outlaw all the things that they consider to be wrong. That's pretty basic, right? And then there are God's laws. God gave His law to Moses to teach the Isrealites how to live properly, how to avoid sin and to serve Him with their whole hearts. God's law is meant to keep people safe from sin. 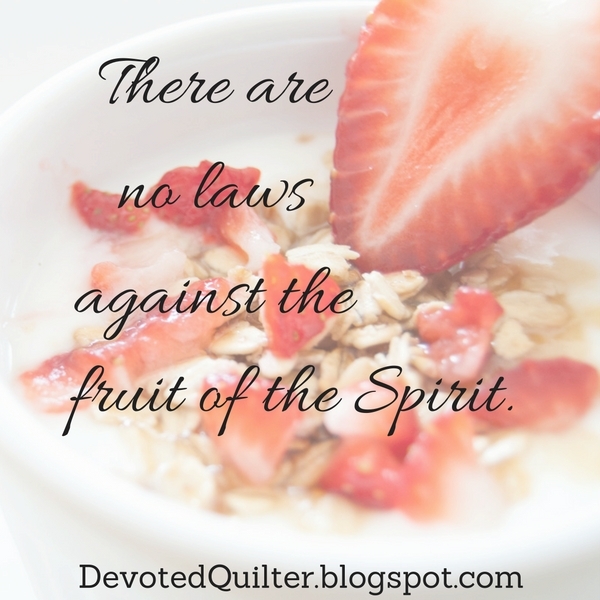 I find it interesting that the Bible tells us that there are no laws against any of the fruit of the Spirit. There is no law against the kind of all-encompassing love the Spirit can cause us to show. There is no law against patience in the face of trouble or against self-control when tempted to do wrong. There are no laws against these things because goodness is no threat to public order. Joy is no threat to a city's safety, and patience, well, that could do wonders if displayed a little more often. I think Paul pointed out that there are no laws against these things as a point of comparison. In Galatians 5, in the paragraph before we see the fruit of the Spirit, Paul writes a list of "the acts of the flesh" (v. 19), which are "sexual immorality, impurity and debauchery; idolatry and witchcraft; hatred, discord, jealousy, fits of rage, selfish ambition, dissensions, factions and envy; drunkenness, orgies, and the like" (vv. 19-21), many of which are against the law. Though they may not all be against society's laws, they are all outside of God's will for us and therefore against His law. All of these actions stem from a person's desire to live entirely for themselves, without regard for God or other people. In contrast to those self-serving actions, there are no laws against displaying the fruit of the Spirit. In fact, it is just the opposite. There is reason to encourage people to grow in their ability to show every one of these traits. Can you imagine the shift that would take place in our world if everyone lived with the fruit of the Spirit as their standard? If people actually lived out love, joy, peace and the others? All of them at once, not just specializing in one or two, but growing in all 9 (which are actually 9 sides of one fruit, remember). Wouldn't that be amazing? Our world desperately needs more of the fruit of the Spirit. The first step towards that goal would be for each of us to become more aware of the Spirit in our own lives and to seek to listen better to the warnings and reminders He gives us. Maybe, though, there is another step we could be taking. Maybe we should also be seeking opportunities to encourage others when they display the traits we've been studying. After all, the more the fruit of the Spirit grows in the world, the better the world will be. Now that my Just the Basics Mystery Quilt has been revealed, I can finally share pictures of it as I'm working on it!! Keeping a secret is really hard when I'm so used to sharing progress pictures as I go. With this quilt, I plan on quilting every possible inch of it. Good think it's only a 48" square! Yesterday I was too tired to do much of anything productive, but I did start playing around with possibilities for what to quilt in the various squares of the quilt. There are three different squares, two of which are on point. It's great to have these books to browse through for ideas! I'm thinking there will be a couple of different types of flowers, something to soften up the lines of the piecing, so that was what I started with. Still nothing definite, but it was fun to play around with ideas, especially when I felt like my brain was mush. In other news, I've been thinking about how we quilters (and makers in general) can be very critical of our own work and tend to focus on the imperfections and the things we aren't good at yet. We also tend to ignore or take for granted the things we have learned to do well. I think it's time to change our focus! 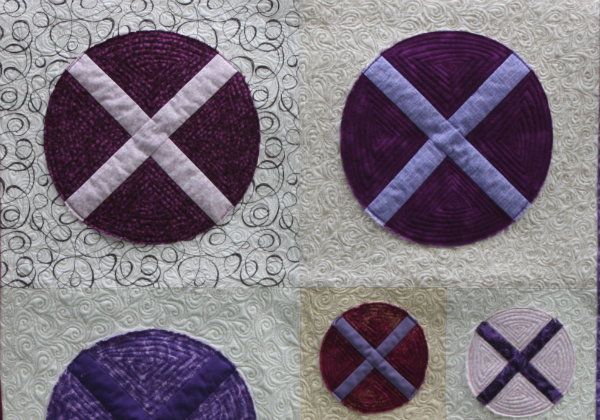 Let's take a look back, really look at some of our earlier quilts and then at our more recent quilts. Let's celebrate all the things we've learned to do, or to do better, whether that's free motion quilting, cutting more accurately, trimming units so points match up better, foundation paper piecing, hand applique...There are so many skills we may have learned, so let's celebrate them all! To help us celebrate together, I'll be hosting a linky party called Then...and Now here on my blog starting on Tuesday, August 16th (that's next Tuesday) and it will stay open until August 31st. Feel free to spread the word! 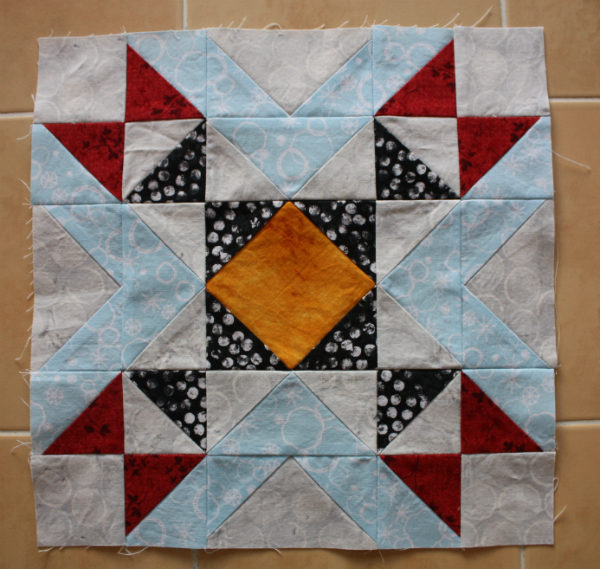 Now I'm off to plan some more quilting and write up my own Then...and Now post! Linking up with Let's Bee Social and NTT. It's time to take a look at the last of the 9 character traits listed in Galatians as the fruit of the Spirit and this week we're tackling self-control. Once again, here is the passage on which I have based this series: "But the fruit of the Spirit is love, joy, peace, forbearance, kindness, goodness, faithfulness, gentleness and self-control. Against such things there is no law" (Galatians 5:22,23). Teaching kids self-control has to start pretty early. We have to teach kids not to grab toys from other kids and how to wait for their turn instead. We have to teach them not to take fistfuls of candy from the bowl, but to just take a couple instead. We have to teach them not to hit or bite or kick when they're angry and how to use their words instead. And we have to teach them to follow the rules, even when they don't like the rules. Molding civilized beings out of naturally selfish, impulsive toddlers is a long process! We want our kids to be self-controlled so there will be peace in our homes and, ultimately, in our towns and cities. God wants all of us to be self-controlled so we can resist the temptation to sin. The more we are able to control our impulses to do what we want immediately, without thinking things through, the more we are able to live as God wants us to live. Thankfully, just as toddlers are not left to figure it out all on their own, so we are not left to our own devices. We have two teachers who can show us the way to self-control, which we then have to implement for ourselves (hence the self portion!). The first teacher we have is Jesus. In Matthew 4 we read about how Satan tempted Jesus after Jesus had been in the desert for 40 days. Jesus had been fasting that whole time, so He was hungry, the Bible tells us in verse 2 (understatement, maybe?). So, while Jesus is 40-days-with-no-food hungry, "The tempter came to him and said, “If you are the Son of God, tell these stones to become bread" (v. 3). Can you just imagine for a moment that you're in the desert, you haven't eaten for 40 days, you're hungry (!) and you're surrounded by stones. Wouldn't the thought of turning them all into bread make your mouth water? But Jesus doesn't. Instead, He quotes Scripture back at Satan. "Jesus answered, “It is written: ‘Man shall not live on bread alone, but on every word that comes from the mouth of God.’" (v. 4). A little aside...Would it have been such a big deal to make the stones become bread? Making bread isn't sinful, after all. I did a little research and it seems there's some debate over why this is wrong, but my take on it is simple...Satan was tempting Jesus with something good and necessary (food when He was hungry) for a purpose that was outside God's will (proving His identity when it was not yet time), which made it wrong, which is why Jesus wouldn't do it. From Jesus we learn that knowing Scripture will help us when we are tempted. If we read our Bible, then we know what God wants for us. We learn how He wants us to live and what sort of people He wants us to be and we can use that knowledge to say no when tempted to do something outside of what He wants. Which brings us to our second teacher...the Holy Spirit. Jesus told us, "But the Advocate, the Holy Spirit, whom the Father will send in my name, will teach you all things and will remind you of everything I have said to you" (John 14:26). Have you ever seen a show where someone has a devil sitting on one shoulder urging them on to something wrong, and an angel on the other shoulder urging them to do right? Well, the Holy Spirit is something like that angel, except He is actually God and He has taken up residence in all believers. When we are tempted to do wrong, it is His voice we hear giving a word of caution or a reminder of the right we should do instead. It is Him who calls relevant Bible verses to our minds in those moments and helps us to resist the temptation. Then the matter comes down to us. After all, this is self-control we are talking about. 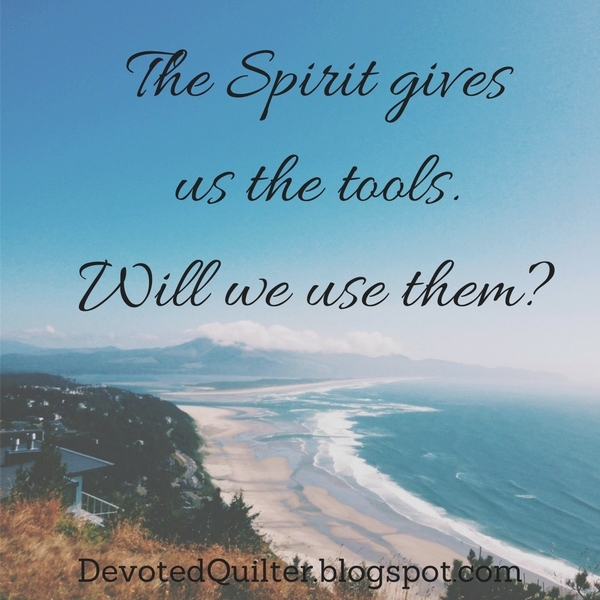 The Spirit can remind us of what we know. He can give us the tools we need to resist temptation. But will we use them? Will we control ourselves? As I said before, these character traits will grow in us only if we allow the Holy Spirit to work in us. If we choose to ignore His warnings, His reminders and His help, then we will continue as we are. But if we choose instead to heed His warnings and make use of His reminders and His help, then we will learn self-control and all of the other traits we've been studying. Just the Basics Mystery Quilt - Putting it all Together! 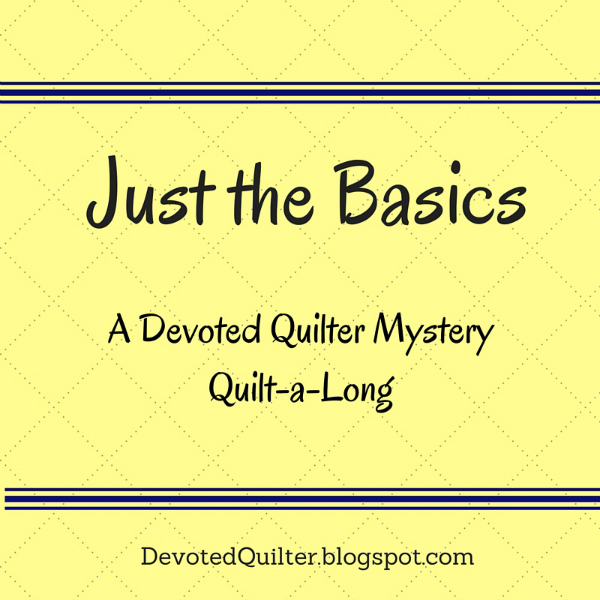 It's the final installment of instructions for the Just the Basics Mystery Quilt-a-Long! These 6 months sure have flown by, haven't they? One last time, here is the important info for this quilt-a-long. In case you're just getting started, March was fabric selection, April was HSTs, May was Flying Geese and Square-in-a-square blocks, June was More HSTs (But Not as Many!) and July was Flying Geese (version 2) and Joining More Units. Now let's get this quilt put together! 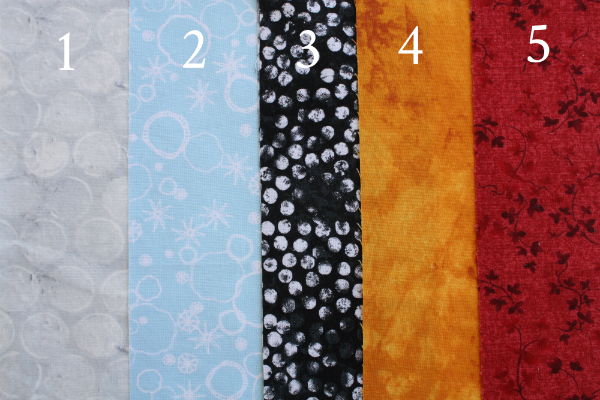 As a reminder, here are the fabrics I chose for my quilt. 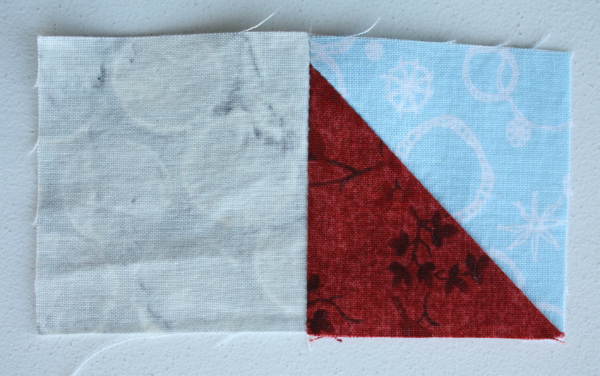 We need some 2 1/2" squares cut from fabric 1, which in my fabric is the grey. From fabric 1 - 64 squares 2 1/2" x 2 1/2"
From fabric 1 - 120 squares 2 1/2" x 2 1/2"
These units use the squares we've just cut along with the rest of the HSTs from April. Just as with Units 1a and 1b, these units are almost identical, so double check you have things turned the right way before sewing them together. For the wall/baby size, you need 32 of Unit 2a and 32 of Unit 2b. For the throw size, you need 60 of Unit 2a and 60 of Unit 2b. Unit 2a looks like this. Unit 2b looks like this. Now we can join the Unit 1's (from June) and the Unit 2's together. For the baby/wall size, you need 32 Unit A and 32 Unit B. For the throw size, you need 60 Unit A and 60 Unit B. Join Unit 1a to Unit 2a as shown to make Unit A. Press seams towards Unit 2a. Join Unit 1b to Unit 2b as shown to make Unit B. Press the seams towards Unit 2B. It's time to put the blocks together! For the baby/wall size, you need 16 blocks. For the throw size, you need 30 blocks. Lay out your units as shown. Sew the units into rows. From this point on, I pinned all of the intersections (yes, all of them!) and pressed all of the seams open. 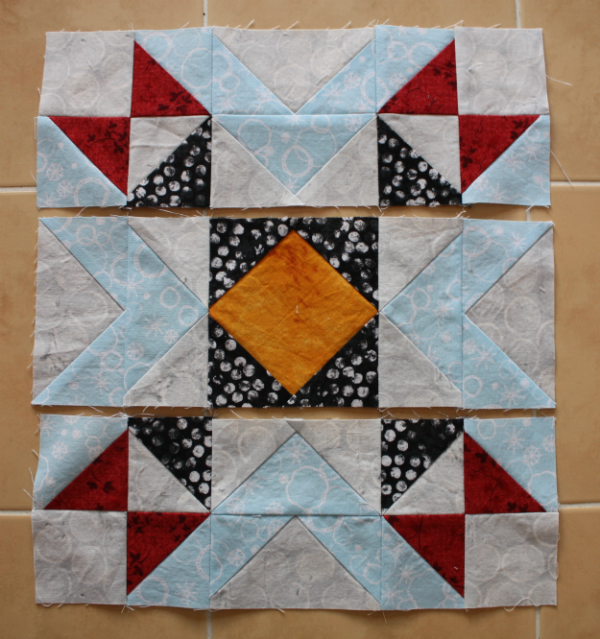 Once the blocks are all sewn, join them together to make the quilt top. The baby/wall quilt is 4 blocks x 4 blocks. 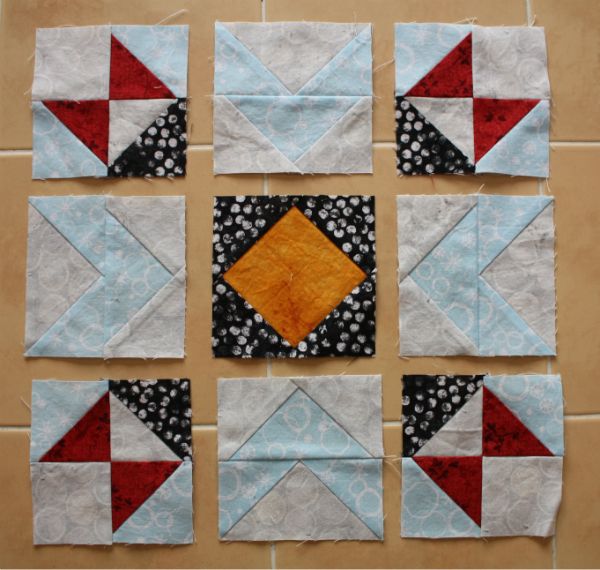 The throw quilt is 5 blocks x 6 blocks. I made the baby/wall size. I love the secondary patterns that emerge! 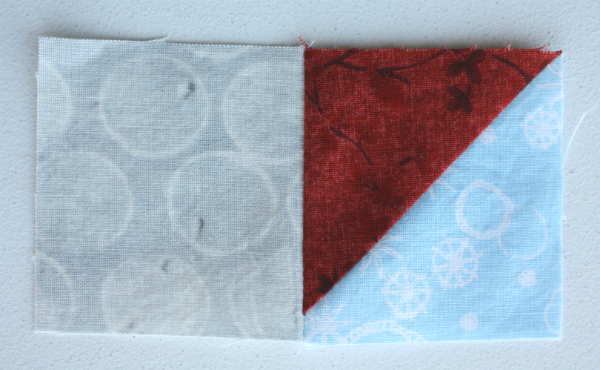 The blue boxes and red stars are so much fun and I am excited to do some custom free motion quilting in the negative space. Thank you to everyone who has been sewing along with me. Seeing your finished pieces each month has been a lot of fun, and I've really enjoyed sharing this quilt-a-long! I hope you have too! 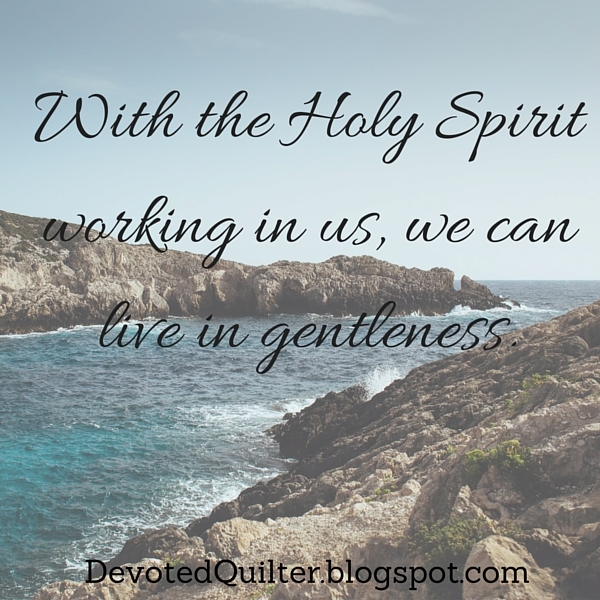 It's time for another Fruit of the Spirit devotion and this week we're looking at gentleness. For those who are just joining in, or if you've missed a couple (this has been a rather long series! ), you can get all caught up with the introduction, love, joy, peace, patience, kindness, goodness and faithfulness. By the way, in linking up all those previous posts, I only just realized that I originally titled the goodness post as gentleness. It's fixed now and this post actually is about gentleness! As always, here is the verse on which I'm basing this series of devotions: Galatians 5:22,23 "But the fruit of the Spirit is love, joy, peace, forbearance, kindness, goodness, faithfulness, gentleness and self-control. Against such things there is no law." In thinking about gentleness, I thought about how we teach children to be gentle when they're touching a baby or an animal. We hold their hand and touch gently, all the while saying, "gentle, gentle." Interestingly though, the Greek word prautēs, which is here translated as gentleness, doesn't really refer to how we treat other people (or animals). According to W.E. Vine in his book Reflections on Words of the New Testament, "it refers to a grace of the soul and its expression towards God. It is that temper of spirit in which we accept His dealings with us as good, without disputing or resisting." The word is sometimes translated as meekness, but Vine says that translation is also problematic because "meekness suggests weakness to some extent, while prautēs suggests nothing of the kind." So a working definition of prautēs would be something like "an acceptance of God's plans and dealings with us as good and right, stemming from a spirit of confidence rather than from weakness." Unlike the character traits we've been looking at up to this point, God the Father never exhibits this type of gentleness, since He never has to accept His dealings with Himself. Jesus, however, did exhibit it while He lived on earth, giving us a perfect example of how prautēs should look in the life of a believer. Picture Jesus, knelt down in prayer in the garden of Gethsemane. He knew that Judas had betrayed Him. He knew He would suffer terribly very soon and He wanted to avoid that pain. He prayed, "My Father, if it is possible, may this cup be taken from me" (Matthew 26:39). Can you blame Him? Wouldn't you want to find some other way to accomplish the goal? But then Jesus accepted that there wasn't any other way. "Yet not as I will, but as you will" (v. 39). You can read my thoughts on the time between those two sentences. A little later He again prayed, "My Father, if it is not possible for this cup to be taken away unless I drink it, may your will be done." (v. 42). That is prautēs. That is accepting that God's way is good and right, even when it is also hard. I don't think it was easy for Jesus to accept the plan. I don't think it was easy for Him to move forward in that moment and agree to go ahead through the pain. I think He was only able to do it because of His full trust in God. And remember that Jesus didn't move forward in weakness. Jesus moved forward in confident power because He knows the Father. He trusted Him completely and was willing to put Himself exactly where God needed Him to be to accomplish the plan. Sometimes it's not easy for us to accept God's plans either. There are times when we are only able to move forward if we believe that, though we may not understand, we can still trust anyway. His plan is always good and always for our good. Though it may be painful in the moment, we can move forward in confidence in our God. With Jesus as our example and the Holy Spirit working within us, we can live in gentleness too.